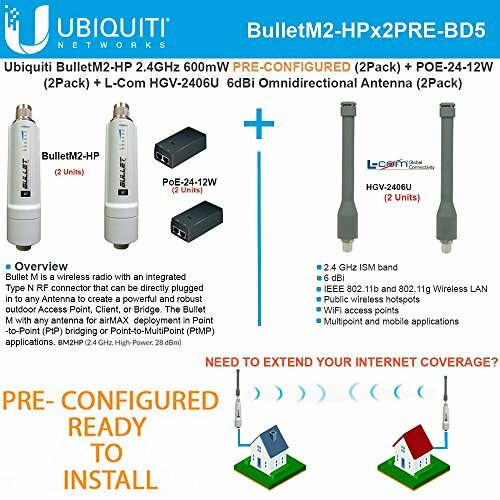 Bullet M2 (2 Units) high power delivers up to 100+ Mbps real TCP/IP throughput, durability to last outdoors, the robust weatherproof case withstands harsh outdoor conditions. Ubiquiti Networks airMAX technology is proven in millions of deployments worldwide, exhibiting outstanding performance in outdoor environments. MultiPoint. L-Com HGV-2406U (2 Units) 2.4GHz 6dBi Omnidirectional Antenna N-Female Connector. Multipoint and mobile applications; IEEE 802.11b and 802.11g Wireless LAN. Ubiquiti POE-24 12W (2 Units) PoE Adapter power Ubiquiti products that support passive PoE. Provides Earth Grounding and Surge Protection.